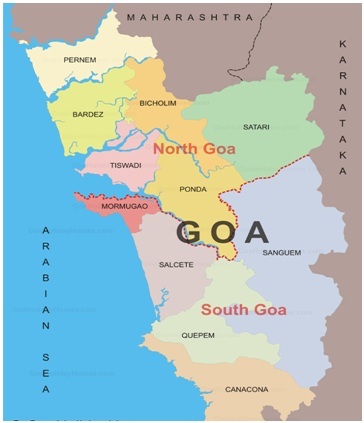 Goa is bounded by the state of Maharashtra to the North and by Karnataka to the East and South, while the Arabian Sea forms its western coast. It is India's smallest state by area and the fourth smallest by population. Goa is India's richest state, with a GDP per capita two and a half times that of the country as a whole. It was ranked the best placed state by the Eleventh Finance Commission for its infrastructure and ranked on top for the best quality of life in India by the National Commission on Population. The official language of the state is Konkani. Marathi is also allowed to be used for any or all official purposes. Goa features a tropical monsoon climate. The month of May is the hottest, seeing day temperatures of over 35 °C (95 °F) coupled with high humidity. Mapusa, Panaji, Vasco, Ponda and Margao. Goa is India's richest state with the highest GDP per capita after Delhi. Tourism industry is its backbone. Corredinho Dance, Dekhni Dance, Dhalo Dance, Dhangar Dance, Fugdi Dance, Ghode Modni, Goff Dance, Kunbi Dance, Lamp Dance, Mussal dance and Romal Dance. The Basilica holds the mortal remains of St. Francis Xavier, regarded by many Catholics as the patron saint of Goa. It is bounded by the state of Maharashtra to the north and by Karnataka to the east and south, while the Arabian Sea forms its western coast. Read more:Why Goa is so special for India? , importance of Goa in India , information , data on the economy of Goa , dances of Goa , festivals Goa , facts about Goa , Most interesting facts about Goa , Gk , General Knowledge , Gk on Goa , Goa Tourism , minerals in Goa , natural resources in Goa , tourism spots of Goa , goa tourism packages , casino royale goa ship , immaculate conception church goa , shree shantadurga temple goa , casino royale goa panaji , goa tourism development corporation. Next Story Would you like to know these Twenty facts about Chhattisgarh?